The first step is to find the URLs for JPEG and MJPEG transfers through HTTP. The URLs are then inserted into the Fibaro interface. The URLs differ from the particular camera manufacturer and model and can be found in the manuals, or sometimes in the advanced settings in the web interface of the camera itself. In the Fibaro interface, the IP cameras can be added in many ways. One of the methods is using the tab Add-ins where you need to install a specific add-in for a specific camera model. This method is limited to specific models and IP camera brands. If your IP camera is not listed there, go to the other method. Click the option Available -> Cameras -> search for your camera brand (e.g. Vivotek) -> click Install. Another method to add the IP camera int the Fibaro interface is the tab Devices. Click Add or remove devices. In the section Cameras to be added click the option Add. 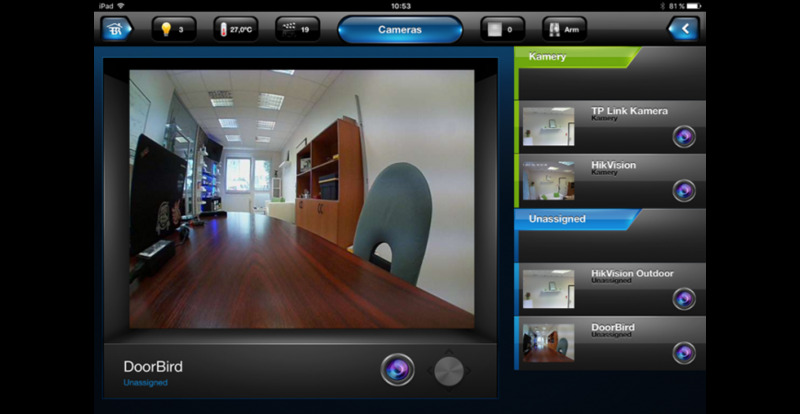 Then it is possible to name the IP camera (Name), place it into a room (Room) and select Camera model. If you do not find the brand of your camera, select Other model. If the brand of your camera is in the list, the URLs for the JPEG and MJPEG transfer will be automatically filled in. If the brand of your camera is not in the URLs list for the JPEG and MJPEG transfer you need to fill it in manually.